Hubby and I always set very strict rules when it came to giving Honey the dog treats and human food. We didn’t want a begging dog following us around all the time or prowling around the table during dinner. She got plenty of treats, but not at times that would encourage begging. The girls were told these rules on numerous occasions. For the most part they stuck to them. But Eldest Daughter, well, she is the softest touch of the family. She began finding ways around the strict treat rules. We realized this one day when Eldest was pouring dry cereal for herself and Honey went running into the kitchen the second she heard the sound of cereal hitting the bowl. We discovered that cereal was “accidentally” falling to the floor every time Eldest was getting herself some breakfast. We knew there was no motor-nerve disorder at work, so we immediately realized what was happening. We keep a can of dog treats on our kitchen counter. Honey usually gets one or two (from me) in the morning. No big deal, I hand out the treats when I am puttering around the kitchen getting my own breakfast. But I am apparently not a reliable treat giver, not like Eldest anyway. Once again, we started to see a pattern. Eldest would get up in the morning and as she neared the kitchen, Honey would join her, every time, doing a dancing dog routine. I wish I was talented enough to video it on my phone and download it for your viewing pleasure, but I am not. So I will try to describe it. The almost 16-year-old dog takes up a position next to Eldest and then bounces next to Eldest, her front feet leaving the ground together. This little parade makes its way into the kitchen where the dancing dog is rewarded for her performance, every time, with a treat. Hum, I am seeing a repeat of the cereal performance from years ago. Eldest and I had fun with the dancing dog routine this morning. She would walk towards the kitchen, and Honey would bounce away beside her. But, if Eldest turned away from the kitchen and took a few steps, no dancing. Then, a couple of steps back towards the kitchen and the bouncing would start once again. I hope I can dance like that when I am that old. I hope someone is giving me treats that make me what to dance! As I mentioned yesterday, Honey was just not herself so I decided to take her to the vet. Hubby agreed, but, lets face it, he was at work 45 or more minutes away and I was going to get the job of taking her. I began the preparation for this adventure by having Eldest Daughter brush the heck out of Honey the night before, hoping to have less dog hair in my car. Yesterday, right before the appointment, I spread a twin size sheet all over the passenger side of the car, floor, seat, and console. Then it was off we go, just Honey and I! I knew that Honey wasn’t feeling her usual self just because she wasn’t a handful and a half on the way there, she was only a handful. unfortunately, the vet office was busy (I guess) as the appointment was at 3:45 and I didn’t see a doctor until 4:20. I didn’t get to leave until 5:10. Felt like I was at a human doctor’s office. I am happy to report that the doctor didn’t feel any masses in Honey’s abdomen but when she manipulated poor Honey’s back Honey’s lips curled up in that “If I hadn’t evolved over thousands of years to love humans and put up with their crap, I would so totally be ripping your face off right now” look. Since it was my face that was within ripping distance of those teeth I was glad she restrained herself. So the diagnosis is that Honey has strained her lower back and needs to take it easy for two weeks as well as take an anti inflammatory. Unfortunately, the x-ray machine was on the blink so guess who gets to take another ride with Honey tomorrow? Yep, I left the sheet in my car. No point in taking it out quite yet! Besides, it makes the Camry look so classy! 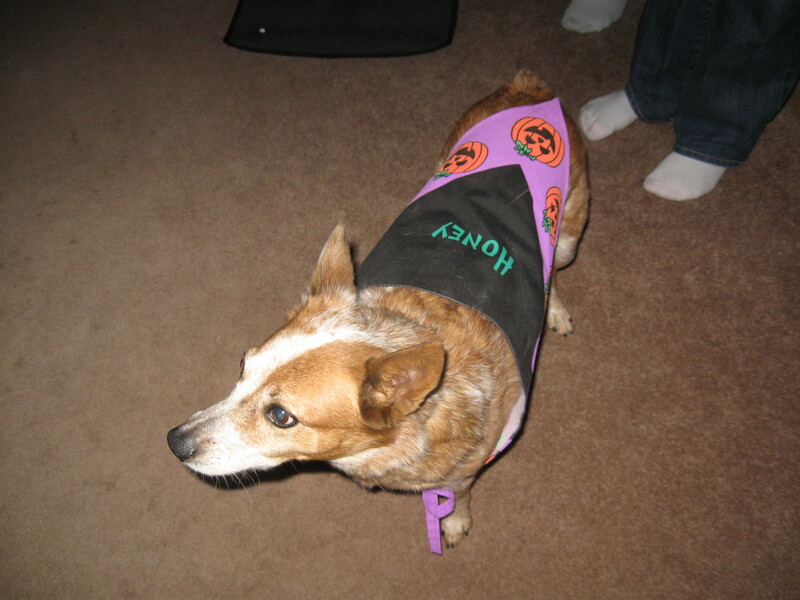 My nervous dog, wearing a Halloween scarf Mark's mom bought her. She hates the camera so it is really hard to get a good photo of her! OK, I have something to confess. Due to my dog’s nervous temperament and her reaction to our move a year and a half ago, my carpet has spots. I am happy to report that the dog has settled down but the end result is that I have used up all of my carpet spot cleaner and, in an effort to protect my dog’s reputation and mine (Of course, with this blog post, I have shot that, haven’t I? ), I felt a need to buy some carpet spot cleaner. Silly me. Apparently, since the last time I purchase such a product there has been a sea change in carpet spot cleaning. Either I am one of only a few hundred people left in America who have carpet, or none of the rest of you gets spots on your carpet. Carpet spot cleaner is one hard product to find! I remember , and until recently had, the spot cleaning foam in a can. Spray it on, rub it in, let it dry, vacuum it up. A very simple process that I have mastered to perfection having owned the Nervous Nellie of dogs for 10 years now. However, we did go through a nice long period there when she settled in at the old house and stopped using our carpet as her personal potty, and since I had a pretty full can of cleaner I didn’t have to buy any more for a few years. What happened???? I looked everywhere – two grocery stores, Target, and finally, at Kmart, tucked down on the bottom shelf so that I almost missed it, carpet spot cleaner! Not the foam kind, but I was so happy to find ANY carpet spot cleaner! It worked pretty well, too. To give credit where credit is due, it is Woolite Oxy Deep +Bissell Stain Fighters Spot and Stain Carpet Cleaner. So, to whatever large conglomerate that owns the company that made this product, THANK YOU!